In the United States, the familiar three chasing arrows symbol (sometimes called the Möbius loop) is ubiquitously known as the "recycling symbol.” The Federal Trade Commission interprets the symbol as indicating that a package is capable of being recycled in areas where collection facilities for the material exist. If accompanied by a percentage, this symbol also communicates the packaging’s recycled content. If the symbol includes no accompanying text or numbers, the FTC interprets it as meaning that the packaging and product are made of 100% recycled materials and are recyclable in a substantial majority of U.S. communities. Use of this symbol is voluntary; however, misuse may subject your company to legal action or consumer backlash. A common pitfall is to place this symbol on packaging without clarifying the type of claim being made. The Recyclable Claims section of this guide explains the U.S. Federal Trade Commission (FTC) guidelines for the use of this symbol. 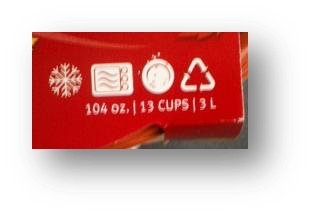 As noted above, use of the universal recycling symbol with no accompanying text or numbers means that the packaging and product are made of 100% recycled materials and are recyclable in a substantial majority of U.S. communities. Unless that claim can be substantiated, the FTC considers this use of the symbol to be deceptive. * The How2Recycle label , described further in Section 4, is an effective way to convey the recyclability of any package. *Disclaimer: This guide does not constitute legal advice. For more information go to the FTC Green Guides Website. DO include text next to this symbol that describes the recycled content percentage or that states that the package is recyclable. DO use appropriate language to qualify the limited availability of recycling programs, if needed. See Recyclable Claims and Recycled Content Claims. 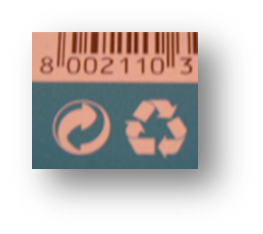 DON’T use this symbol to make recyclability or recycled content claims unless you have solid substantiation of the attributes claimed. DON’T use this symbol alone unless the packaging and product are made of 100% recycled materials and are recyclable in a substantial majority of U.S. communities. This clearly states the recycled content percentage of the paper packaging. When using the chasing arrows symbol, it’s advisable to always include the recycled content %, even if it’s 100%. 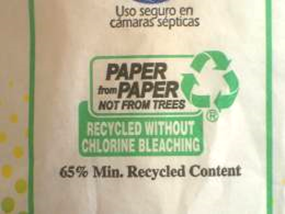 The symbol lacks specific text that describes the recycled content percentage or states that the package is recyclable. The symbol alone without this additional information can mislead consumers, who may assume the package contains 100% recycled content and is recyclable in a substantial majority of U.S. communities. See above. Also, using the universal recycling symbol next to the Green Dot may confuse consumers.